Are you ready to focus on and leverage your Zone of Genius? 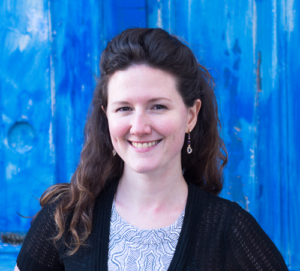 If you said yes to any of those, or if you’re hanging out in overwhelm city, there aren’t enough hours in the day and you always feel like you’re scrambling, you need systems. Systems are simply consistent ways of getting things done that are made up of a mix of people, technology, and processes that create an intended outcome. It’s a structure that’s created to hold all the parts of your business together so work can flow. Ideally, this is set up to be like a wide-flowing river – not a creek with lots of beaver dams on it. Better and more effective systems are the train tickets out of overwhelm city. You’ll find that you know what’s going on, what needs to happen, get to do more of the stuff you love in your business AND you work less while making more money. You might have a blogging system that you follow to create high quality content on a consistent basis. Or a client on-boarding system that sets up your clients to have an amazing experience EVERY TIME they work with your business. In systems are embedded culture, values, creativity, your essense… The systems of your business create a microcosm, an ecosystem that can reflect your unique way of being and working. Building systems is simply about bringing consciousness to the process of how you (and your team) get things done in your business. In this process of bringing greater consciousness, what’s not working, what could be working better, and what could be simplified comes to light. 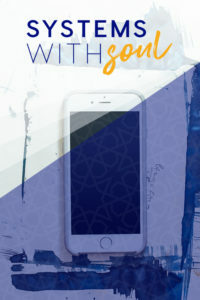 You also find out ways to work more joyfully and more in alignment, which makes the process of running and growing a business all the more enjoyable. Unless you’re building systems, it’s easy to stay in a place where you feel like you’re always racing against the clock. Talk about hanging out on the burnout path. By getting clear about where you are, you can let go of any need to be polished and perfect and simply be clear about where you’re going and keep building without all the mental runaround. 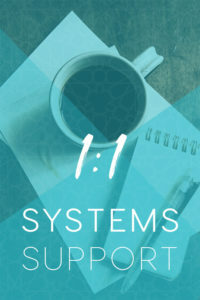 With systems, it’s easier to add on and change the business without it being a huge hassle – that’s what systems are for. When you have insight into what IS working, you won’t have to dedicate extra energy or resources into what’s already solid. You’ll gain back extra brain space because you’re no longer trying to hold all the details. Since you have places for all that knowledge and insight to go to be actioned, you can trust you won’t lose momentum when you step away. You might even find that you can take weekends and lunch breaks! Not in front of the computer, but away from it and you might not even think about work for hours or days at a time. Imagine being able to work the same amount of hours (or less! ), but do MORE of what you love doing in the business while being able to serve more people that need your particular sauce of brilliance. You will be able to slow down and enjoy the ride, rather than the process feeling like a drag. When you expand what you’re able to do without YOU having to work more, you enable yourself to be able to make more money, expand your impact, increase your creativity in business, while kicking that annoying overwhelm gremlin out. That is why systems are awesome and worth making work for you. Your business is like an ecosystem. There are lots of different parts that interact to create something bigger than just each one of the parts individually. There’s a symbiotic relationship that happens when these pieces work well together. 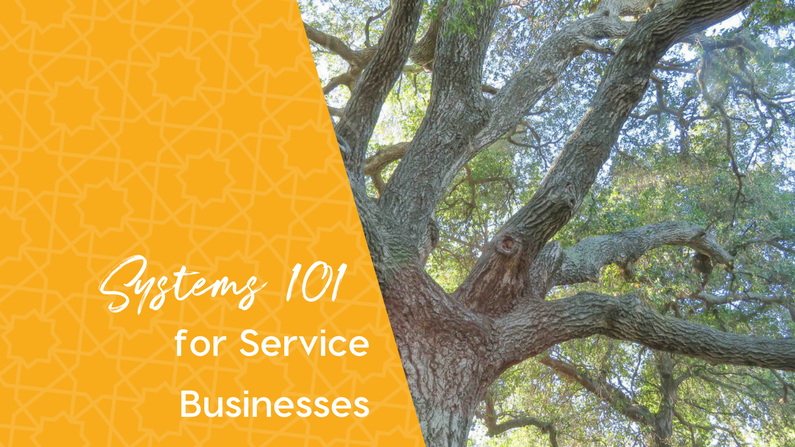 When you think about your business as an ecosystem, how you create systems is informed by the way you do things and why you make certain decisions. Think about a river. There’s a lot of potential energy in a river. But if the river didn’t have banks, it would be diffused everywhere. The water wouldn’t be channeled. You are the river. 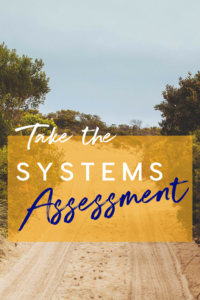 Your systems are the river banks, the roots of the trees that prevent erosion on the banks, and the rocks and bends that slow the water at certain locations along your trajectory. All of these parts support your journey and help you flow. Without a container for the river, the fish and other aquatic critters wouldn’t have a home. Systems operate in a continuum. There’s no wrong place to be, you are where you are. Just like ecosystems. They are where they are in their development. There are no “have to’s” and there are no “shoulds.” There are no places that you’re supposed to come out at on the other end. It’s just about you having the opportunity to explore and decide what kind of journey you want to have and where you want to go. With systems, there’s no done and there’s no perfect. When you align your systems you support your creativity and amplify your impact. You can improve the way you’re working so you’re more effective with your time and the way that you showing up on a day to day basis. You can have the impact that you want and do meaningful work without going to a place of overwhelm or burnout or spreading yourself too thin. This process of building systems is about consciously choosing what needs your attention, effort and investment of resources. Ultimately that starts within, that starts with you making those choices. Ready to level up your business systems? Join me at the Level Up Your Business Systems Workshop. During the event, you’ll work through a framework to pinpoint the current level of your systems in personal organization and planning, financial management, sales, and marketing. It’s an opportunity to uplevel your systems in real time. We cover a bit of theory, but spend 80% of the workshop taking action! It’s going to be a lot of fun and super practical and actionable after the fact.